Can anyone list the differences between the early cars and late ones. I can see that the radiator is sloped back (or is the bottom sloped forward) and the fenders are skirted. Were there mechanical differences. It seems there are very very few of these later cars (even less than the earlier ones!). N1 and N2 have a completely different dashboard, with big round instruments in the center and a couple of glove boxes at each side. Bumpers are one piece, curved downward in the center in the case of the front one. Radiator emblem is very similar but different: REO in big letters, and Royale under it, instead of the Reo-Royale and Eight under it, as in 1931-32. Apparently the grill has fixed vertical bars, verus the thermostatically controlled ones in 1931-32, which makes me think that for 1933-34 they already had an in line thermostat. And of course, the possibility of the semi automatic transmission. But again,this is only based on observation. There might be a ton more differences that I couldn't spot. Here is a picture of a 33 N.
Nice pic, A.J. thanks for posting what seems a very "colorful" car for the era, but clearly original. I recently bought a Royale that is a 1933 N1 based on the number stamped into the frame "1N2119". The grill is vertical, not sloped like the one shown earlier in this thread. Is the 1933 N1 basically the same as the 1931 8-35 and the 1933 N2 the "new" style with the sloped grill? Welcome to the Royale Forum . Additionally to what is posted above, one further note based on observation: by 1933 the Royales (in this case at least the N2 as I have not seen a pic of a N1, but I take it they would have the same treatment) do not use fender lights. 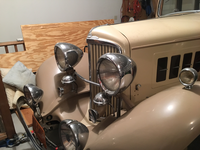 The headlights must have had the parking lights inside the main headlight unit… but perhaps some of you 1933 owners can confirm on that one. Also, as A.J. noted, the side spare tire covers are different, fully enclosed on the case of the N2 at least. Now, as to your question: "Is the 1933 N1 basically the same as the 1931 8-35 and the 1933 N2 the "new" style with the sloped grill?"... I think you may be right! I have only one "old" pic in which an N2 at some show is shown but that also shows a large sedan on it's side that could very well be an N1, and in the little that can be seen the grill would appear to be vertical (as in the 8-35) and it appears to have the one piece bumpers. Unfortunately parking lights cannot be seen. It also shows external horns just like what your car has (earlier Royales use an internal Klaxon 18-C horn, if memory serves me right) and straight type door handles (earlier 8-35 has curved handles). The car that can be seen from the front is clearly an N2 and I believe the light car on the back is also an N2, a coupe in this case... the curious and interesting thing to me is the center car, which I am guessing that may be the N1, but it is the only pic I have seen of one, and it shows it basically as an 8-35 with the minor differences that I mentioned above. This would help settle the doubt some of us had on the "other" 1933 car that was auctioned some time ago and that shows also the earlier body style with the one piece bumpers and external horns... and the semi automatic gearbox which we know was introduced for 1933. So, summary is, I think you may be right with your assumption. But of course, I am no authority.